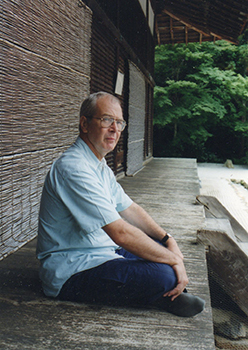 Mike Barrett first visited Japan in 1970. Mike Barrett OBE is a devoted supporter of the Sainsbury Institute and serves as a member of the Institute’s Management Board. With a wealth of knowledge, experience and understanding of Japan as Director of the British Council in Japan for most of the 90s, he has been instrumental in helping UK institutions and businesses establish good relationships with their Japanese counterparts. 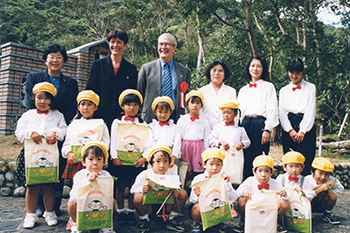 In recognition of his contribution to ‘promoting the culture of and enhancing the understanding of Japan among British people, Mike was awarded the Order of the Rising Sun, Gold Rays with Neck Ribbon presented by Ambassador Yoshiji Nogami on behalf of His Majesty the Emperor of Japan in 2006. He continues to nurture productive exchanges and enrich cultural relationship between the UK and Japan. 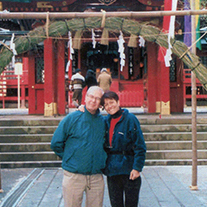 In this issue, we ask what prompted his life long passion and interest in Japan. First impressions of Tokyo in 1970 were not encouraging after 36 hours of travelling. The drive into the city from Haneda was through drab suburbs and the industrial smog and traffic fumes stung our eyes. When we arrived at our hotel, our two-year old son asked, “Are we in Japan yet?” I knew how he felt. There were no comforting clichés: no sakura blossom, no Fuji-san visible through the smog, nokoto music to drown out the rattle of the air-conditioning, no kimono-clad lady serving tea. But across the moat of Sotobori-dôri, the walls of the imperial palace beyond the stream of traffic hinted at histories and mysteries yet to be revealed. Meanwhile, there was ‘Hello Kitty’ and ‘Tiger Mask’ on the terebi, among the adverts for the ‘three Cs’ – cars, coolers and colour TV. Over the following decades Japan grew brighter as it grew more prosperous and generously opened itself up to us as we explored the country, made friends, visited museums, temples and gardens, and enjoyed theatre, music, hot springs, the food and the language. Our first baby sitter turned out to be the grand-daughter of Suzuki Daisetsu, whose books on Zen Buddhism had originally piqued my interest in Japan. That interest now deepened. Japan became our second home and taught us a lot. Take learning to write kanji, for example. My ability in calligraphy was minimal but our strict teacher drummed into us that “you cannot learn kanji with the head, you must learn with the hand”, which meant drawing the brush in controlled ways that could not be forced. The strokes had to be made in the right direction and in the right order, holding the right posture. These days, the oyayubizoku (the ‘thumb tribe’) are all busy texting, but the significance of gesture and body language (kata) in so much of Japanese culture remains, not just in the martial arts, dance and theatre, but in social life as well. There’s a right way to do everything and the habits of social exchange help to oil the wheels of daily life. In Itami Juzo’s humorous film O-sôshiki(The Funeral) the younger members of the family study a video showing exactly how to behave and what to say at funerals. There is an ’aesthetic’ sense that flows through the social culture as well as the material culture. Formality and conformity are obviously not as strict as they used to be. Much of the exploding Japanese youth culture of the last two generations has been a revolt against traditional values, although not, I think, a total shift to individualism. Even the ‘Gothic Lolitas’ and ‘Cosplay girls’ of Harajuku are still anxious to follow the trend and be part of a recognised group. Being in (uchi) or out (soto) was another thing I became intensely aware of in Japan. But uchi and soto apply as much to the social environment as to the physical. The vertical and horizontal loyalties and factions that operate in and between Japanese organisations affect everything and everyone (including the running of the nation!). The fact that so much goes unspoken is also a challenge for a gaijin who has to learn hara-gei(‘belly-art’ or ‘intuition’) and read the body language and facial expressions that will reveal more than what is actually said. Then comes the delightful moment when, without pushing, suddenly you are no longer soto but uchiand a lasting relationship has been formed. Theatre director Suzuki Tadashi said his world was like a skin that he would not let anyone penetrate, but after Welfare State International from UK performed at his festival in Toga Mura and he took a production to London, the barriers were down. So the theme has been outward forms and hidden meanings, just as in the arts. 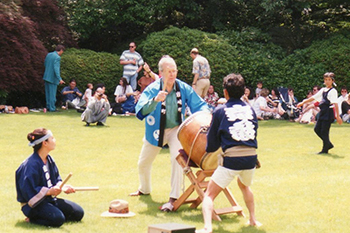 Which brings me to the Sainsibury Institute for the Study of Japanese Arts and Cultures and why I am so glad to have been associated in a small way with its growth and development. The surface attractions of Japanese culture are obvious -” from Yayoi archaeology to the art of Yayoi Kusama” as my art-historian wife says – but without explication and interpretation, based on research, intimate knowledge of the field and close contact with Japanese counterparts, the underlying significance of outward forms can remain unrevealed. We are lucky to have in Norwich a team that does so much to open our minds to new ways of seeing.